Corporate Social Responsibility (CSR) is an increasingly critical issue for firms, employees, consumers, investors, governments, and NGOs. Organizations must be able to successfully develop and implement strategies to effectively manage CSR and sustainability to future-proof their organizations and careers, and create competitive advantage. Some see it as just charity, but companies that “get it” and embrace it strategically can use CSR and sustainability performance to drive success and propel innovation, cost savings, brand differentiation, and customer and employee engagement. Whether you embrace it or not, you should be prepared for the impact that CSR’s increasing importance will have on your organization, sector, and career. With decades of experience working with CSR and Sustainability, the professionals at the CSR Training Institute can help you better position your organization for success. With our guidance and expertise, you’ll be ready to turn challenges into unique opportunities, create a strategic competitive advantage to drive success and facilitate a synergistic alignment between business value, social value, and environmental stewardship. The CSR Training Institute’s team has 20+-years experience with a variety of projects, programs, and training throughout West Africa, including Nigeria. They have helped dozens of public and private organizations from around the world to integrate and align shareholder value through strategic CSR and engagement with the SDGs. Business today is under increasing pressure to produce social value while aligning shareholder value, social impact and environmental stewardship to drive success and competitive advantage. If your organization wants to become more efficient in these areas, this is a program that you should not miss! This program covers the full range of key CSR topics with a focus on efficiency, impact, and results. From standards and norms, to impact measurement, social license, reputational capital, partnerships, environ- mental economics and more, participants will be guided through the basics of using CSR to create value, impact, and advantage. Using a unique blend of lectures, videos, small group-work, customized case studies and role-playing scenarios participants will comprehend critical issues. Social impact and sustainability performance have become critical for business and career success. They are key success factors, yet most organizations struggle to effectively measure and manage social impact, resulting in less effective management, planning, budgeting and financing of programs that can drive business results. By learning what to measure and how, identifying key metrics and properly gathering and managing data, you can give your organization a key competitive advantage in this dynamic and rapidly evolving landscape. 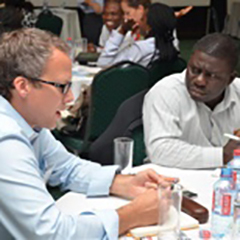 Two days of interactive lectures, videos, small group-work, customized case studies and role-playing scenarios provide participants with a strategic understanding and practical tools to drive business and sustainability performance.